As I sat in the audience in Los Angeles, moments before the gameplay reveal for Destiny 2, I couldn’t help but question my expectations for the event. I’ve attended many E3 press conferences before, I’m no stranger to the spectacle and excitement that accompanies reveals of this sort, but it was unique to see such an intimate atmosphere filled with so much anticipation. But what was that anticipation about? What was the great hope for Destiny 2? Did people want to see it further embrace the trappings of traditional MMOs with more complex systems and larger open worlds? Did fans want a more traditional shooter experience like Bungie’s previous Halo entries? Much in the same way I pondered what exactly Destiny was in my review of the game, I now wonder what a Destiny sequel means today. But as I watched the gameplay trailers and as the Bungie team members spoke on stage, it began to dawn on me that Destiny has almost transformed into its own kind of video game. Something that was both about community and competition, playing solo and cooperatively, shared and personal. It’s an interesting dichotomy of design that Bungie has honed since the game’s initial release in September of 2014. While my review of Destiny at launch was lukewarm, I thought the expansion The Taken King was an improvement in design and in narrative - and I think the minor shifts in gameplay and tone became even more clear in my time with Destiny 2. I had a chance to play through a campaign level on both PC and PS4, and the thing that stuck out to me the most was how Destiny 2 raises the stakes, while simultaneously undercutting them. The smoldering fires that burn beneath the large “2” in the title communicates a darker chapter in the series, and with the opening gameplay scenes depicting the fall of The Tower, it’s hard to imagine the stakes being raised much higher. Yet, as I said in the Strike Mission preview, the dialogue in the game feels less serious. Maybe it’s the fact that they unloaded so much exposition in the previous game, but in my time playing Destiny 2 no one stopped to explain what race was attacking us or the ancient history of where we were fighting. Instead, the dialogue seemed to sever the action of the game and there’s a level of “fun” to the tone of Destiny 2 that I think the first game was sorely lacking. During my time with the single player portion of the hands-on demo, I was launched from one set piece to the next at a mile-a-minute. 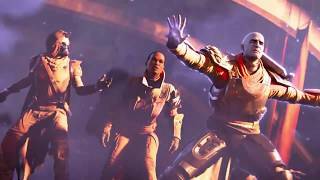 The level felt far more in line with what one would expect of a Bungie game in 2017, showing off impressive cutscenes and injecting the gameplay with cool spectacles, like Ikora leaping onto a dropship and blowing it up. It appears that not only are these characters supposed to propel the action scenes forward, but they are going to be a source of motivation in Destiny 2. Game Director Luke Smith talked about the fate of Cayde-6, Ikora Rey, and Commander Zavala during the press briefing, and even during my hands-on time it felt like the game was going out of its way to set these characters up for arcs throughout the game. Giving the trio of Vanguard more screen time might not seem significant, but compare this to their roles in the first game where they were little more than vendors, and it’s a decent shift for the series. Again, this was something Bungie started building towards with The Taken King as the Vanguard Mentors went from uttering the occasional line of dialogue when giving you quests to being more prominent characters. To be frank, it’s a little surprising it took this long - you don’t bring in actors like Gina Torres, Lance Reddick, and Nathan Fillion to make them shopkeepers. But the biggest news with the announcement of Destiny 2 is that it is coming to PC. So how does the PC version stack up? It's favorable, of course. The PC version takes advantage of the added power from high-end hardware and delivers a level of visuals most people would find superior to consoles. It’s funny, but as I chatted up the numerous Bungie employees roaming the floor at the preview event, it already felt like some of the team were gravitating toward the PC for the obvious reasons - “obvious” being the precision of a mouse/keyboard set up and the ability to run the best the tech money can buy. Yeah, if you got the PC to hack it, Destiny 2 can look pretty fantastic. Maybe it’s the new tech, maybe it’s a new look, but Destiny 2 felt more colorful as I played through the opening mission. Granted everything was saturated in the orange flames of destruction, but as I got further from the opening area and deeper into the mission, I noticed flares of color that stood out to me. Though, while playing on PC, I couldn’t help but constantly have my attention pulled away while I tried to navigate the controls. I know, I know, I’m a PC noob who should “git gud”, but the issue isn’t just the mouse and keyboard set up, but how much of the keyboard is taken up with multiple commands. It’s something that might be taken for granted in Destiny’s controller interface, but a lot is being done with very little real estate, and the PC’s solution is less eloquent - as basically the entire left third of keyboard is assigned a function. And there was something that just felt right once I was lounging in a chair, controller in hand, with a giant TV showing off all the explosions of Destiny 2’s opening cinematic. I really felt at home with the game on PS4 and felt like I could better evaluate the controls. It’s more of the same really, but that’s not a bad thing. The action all feels as good as the first game did. The weight of the firing, the smoothness with which you can glide around the combat arenas, it blends together in that way that Bungie has done time and time again with their rich history of shooters. I said in the Strike Mission preview that Destiny 2 does a better job of adding another dimension to the combat by forcing you into the air more often, and it helps that I also felt like hanging in the air and shooting was a smoother process. There was a fluidity to the combat that feels like a refinement. However, gameplay was never the issue with Destiny. What irked me during the first game was the level design and it’s hard to get a sense of any changes from the opening mission I played through. The level was still a series of corridors that link together rooms of baddies, especially in the latter half, but a couple of sections were certainly more open and begged for more inventive tactics. But again, what stuck out the most was how other characters were weaved-in through the mission. 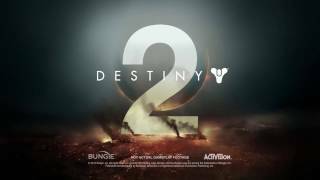 The first Destiny was very monotonous in its delivery of narrative and missions, but while I played Destiny 2 I was aware of the motivations for the character and those around me - granted the motivations were largely “OMG! The Tower is burning!” But still, it’s better than nothing. A sense of motivation and stakes can turn a corridor shooter into something a little more exciting. If I was to tritely sum up my time with Destiny 2, yeah, it’d probably sound like “Same ol’ Destiny”. But that’s not really reflective of what I played. Of course, I only got a taste of Destiny 2 last Thursday, but in sampling the game I felt energy that I don’t think the first game or any of the expansions really had. I could not recount to you any moments in the original game where I felt a sense of engagement or thrill, but Destiny 2’s opening mission really had me interested in where it was going. On the bus back from the preview event, a couple of people theorized that after the opening, the cinematics could disappear and the game would fall largely back into the trappings of the first. Sure, that’s possible, but if I was to take Bungie at their word, and to take the little bit of gameplay as a representation of what they’re trying to build, Destiny 2 seems like it’s continuing its work off of the expansions to refine and explore all the elements the first game painstakingly set up. It might be that I took a nice long break from Destiny, but the fact that Destiny 2 plays in a familiar way while feeling different intrigues me. I don’t think I was wowed during my time with Destiny 2, but that’s not a bad thing. Destiny 2 might be delivering exactly what it says on the box, but for game development these days, that’s actually quite a feat. 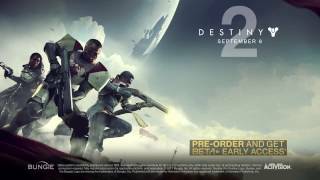 Destiny 2 will launch on Xbox One and PS4 September 8th, and on PC sometime thereafter. Read more about the game in our Strike Mission preview and PvP Multiplayer preview. Disclaimer: Activision covered travel and hotel costs for New Game Network to attend a Destiny 2 preview event.